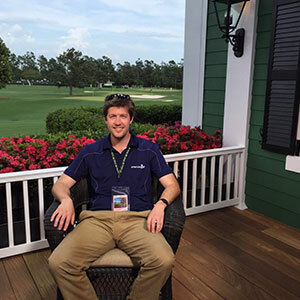 Daniel Gathercole, Head of Marketing at American Golf, talks about his incredible first experience at Augusta National. Everyone told me how The Masters was different. A once in a lifetime experience, unlike any other golf tournament. And while I knew this trip was going to special, it was only when I entered the gates that I really started to believe them. Driving in past the fast food restaurants, I could have been anywhere in America. I started to doubt I was in the right place, but then from no-where Augusta National appeared. From the moment I arrived on the Tuesday practice day, I entered The Masters dream world. Walking in through Gate 19 took me straight to my first iconic view, the 16th green where Tiger chipped in on his way to victory. I could hear the roar of that crowd in my head and couldn’t wait to explore further. As I relived this truly iconic Masters moment, I had my first ‘unseen Masters’ moment – the portaloos! Immaculate, attendants to direct you and even hand towels at the sinks. The attention to detail ran through the whole event. Back on the course, the greens, the rough - if you can call it that! - the bunkers and walkways were all pristine, not a weed in sight and not a blade of grass out of place. The vivid greens were incredible and almost made the beautiful azaleas look dull. One surprise was the undulation. The course looks fairly flat on T.V. but some of the slopes were ridiculous, especially on the par 3 fourth and sixth. It makes for some tricky golf but the viewing is fantastic. I stood near the 11th green and watched the guys tee off on the 12th, watched the approach to 15, could see tee shots on 16 and then turn around to see approach shots to 9. Wherever I looked there was a view I’d seen every year since I was a kid, nostalgia was round every corner. But to hear and smell and feel the occasion took the experience to a level I’d never imagined possible. My favourite hole is the par five 13th. I could see the big hitters going for the green in two and incredible pitches from those who layed up. It’s such a great hole. Time for refreshment and another surprise. Unlike any event I’d ever attended food and drink were cheap and being from Yorkshire I appreciate this more than most! Sandwiches for $1.50, beers $4 and soft drinks $1.50. I even got to keep the plastic 2015 Masters cup it was served in! I headed back to the 16th following the chants of “skip skip skip” and watched the best players in the world skim balls across the pond. The best I saw was 4 bounces from Sergio. It ended up a better result than his initial tee shot. It’s a wonderful atmosphere with the crowd getting behind every player and the players playing golf shots for fun. The first Championship day on Thursday took on a whole new feel. The atmosphere was electric. I watched eventual winner Jordan Spieth play the back 9 and create Masters history. He just has something about him, that inner belief that you see in great players and I’ll never forget the few hours I followed his group. I was amazed at the view I could get even though there was so many following him. The course is set up so well with a slope or a vantage point just around every corner. And while you could feel the anticipation of every shot and the atmosphere buzzed, the crowd was respectful and supportive to every player, a true golf crowd who knew the game and were in awe of what was on view. However far from work I was I’m still a marketeer at heart and was so impressed by the branding on everything. You drank "diet cola", "domestic beer," "sports drink," or “water.” The only consistent thing was “The Masters” in front. Before I left, I headed to the gift shop to get a few mementos of an incredible trip. Again the prices were great. I’d seen the gifts at many other golf events. Ball markers and flags to teddy bears and tea towels. It was the addition of that yellow map with a flag through Augusta that made me fill my basket. This was The Masters, a tournament like no other and, in my opinion, the best golfing event in the world. If you ever get the opportunity to go, don’t turn it down! Want to experience the electric atmosphere of The Masters at Augusta for yourself? Then check out our incredible competition where you can win a trip to one of the most iconic golf courses in the world and watch the event unfold. Click here to enter and good luck!